I couldn’t turn this one down. It was free. For those of you who don’t know, I’m a computer operator for the Accounting Department at Coburg Dairy. Our story began when Robert walked up to my desk with a registration form and told me that Coburg Dairy was sponsoring a local 5K race at the baseball stadium, of all places, along with the Bubba Gump Shrimp Company. 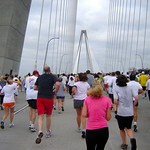 March 31, 2007 was the day of the 30th Annual Cooper River Bridge Run, and I was right there in the middle of it. 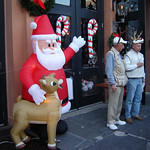 This year I had more trouble with the crowds, and it shows in my times when compared with last year. That’s okay, though. Unless you’re a professional runner, this event is more for fun than anything else. 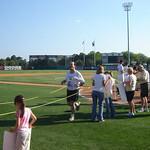 This race is a memorial for Laura Griffin, who used to work at the College of Charleston a few years back. She was the Director of the Office of Substance Abuse Prevention until she was killed in a hit-and-run on the Battery in January of 1996. Laura was apparently a big proponent of healthy living, So the folks at the college decided to honor her memory with a 5K race. Happy New Year, everyone. I’ve done enough of these races to become part of the local running community. Information just sort of floats to me now about where and when the races are. It’s pretty cool. 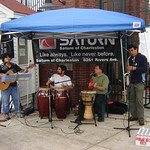 As with the other races, there are many different kinds of people involved, and people have individual goals for their times and performance. 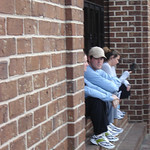 Yet another 5K race in Charleston, just two weeks after the Turkey Day run! I found out about it on Thanksgiving morning on my walk from the parking garage to registration. Someone had posted a few signs with the dates and information. Happy American Thanksgiving Everyone! (It’s a late wish, but it’s better than nothing.) While most of you were sleeping soundly on Thanksgiving morning, I was awake and dressed for a race. Since I overtaxed my ankle during the Race for the Cure I’ve been gradually training it up, and at this point I’m finally ready for anything. 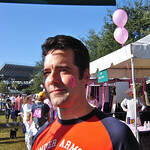 This year I participated in the Charleston, South Carolina Race for the Cure. 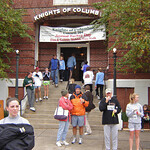 It’s a 5K (3.1 mile) benefit race which promotes breast cancer research. It’s the first race I’ve participated in besides the Cooper River Bridge Run, so I was pretty excited. The only snag is that I haven’t fully regained the level of fitness which I had before the accident.